Mindful Bodies licensed professional counselors & therapists help clients address the 6 dimensions of wellness through individual and group counseling for general weight management, Binge Eating Disorder (BED) & Bulimia while at the same time treating the co-existing issues of distorted body image, self esteem, self image, anxiety and mood disorders. We offer individual mental health counseling sessions, for binge eating disorder, bulimia, pre and post weight loss surgery mental health concerns ad co-occurring problems such as self esteem, self image, body image & depressed mood. 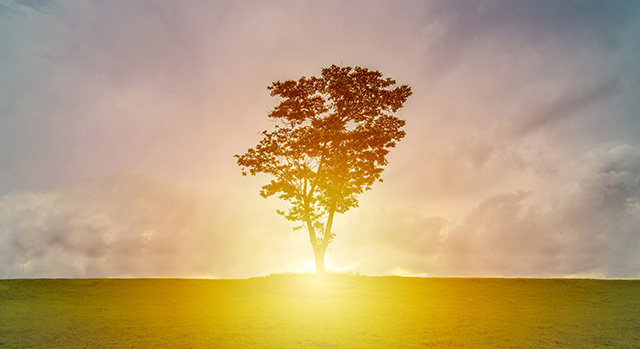 The cost of our individual mental health counseling sessions is $100 per session. 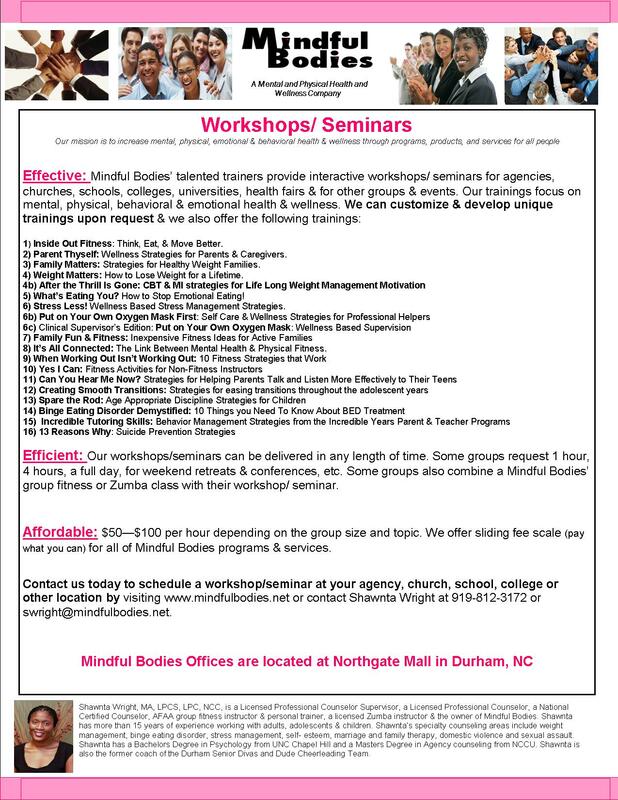 Sliding fee scale (pay what you can afford) is available for all of Mindful Bodies programs and services. Our 12 week Bulimia Nervosa (BN) & Binge Eating Disorder (BED) Cognitive Behavioral Therapy (CBT) Group is held on Thurs nights from 7 – 8:15 pm during the weeks of (see dates on our home page in the upcoming events section). Make-Up sessions are held on-line via the webex app or www.webex.com. Pre-registration & an intake session are required for group attendance so contact shawnta wright at 919-812-3172 for more information. New group members can be added until the 3rd week of group so you can still enroll in group after the group start date. We also offer individual mental health counseling sessions if the group won’t fit your schedule or needs.The cost of the BN & BED group is $20 per session. The cost of individual counseling sessions is $100 per session. Our next 12 week FM/FB group will be held on Mon nights from 7 – 8:15 pm and make-up sessions are held online on webex.com . 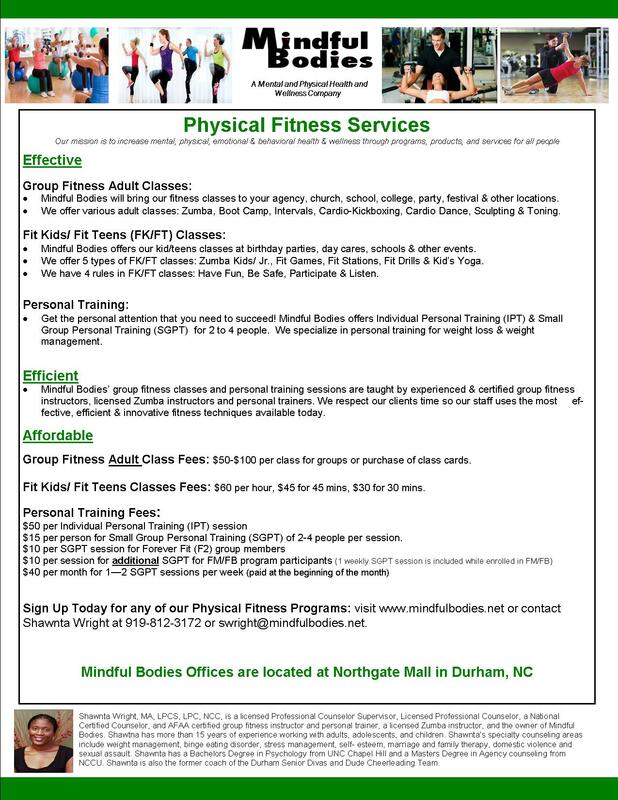 Pre-registration & an intake session are required for FM/FB individual or FM/FB group session attendance so text or email Shawnta at 919-812-3172 or swright@mindfulbodies.net. We can accept new group members in the FM/FB group through the 3rd group meeting of the group cycle. 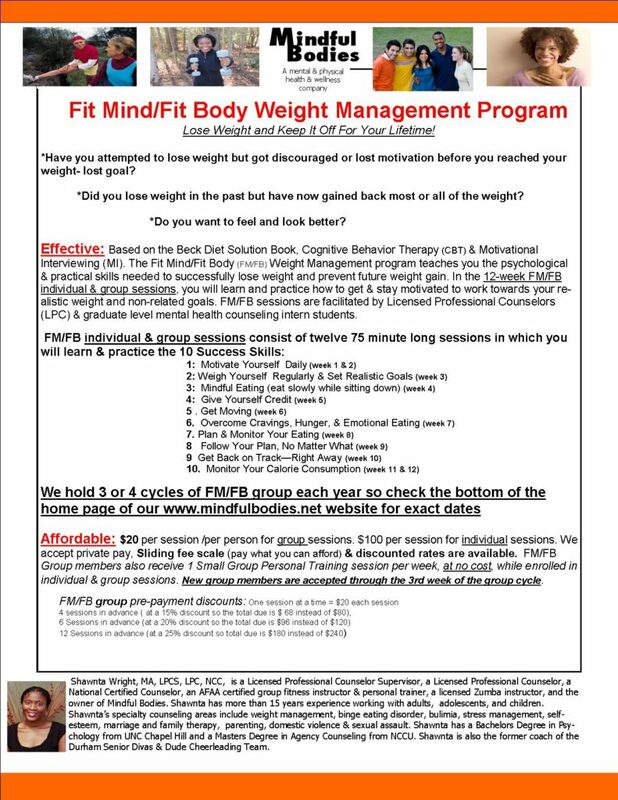 The FM/FB group helps clients who are overweight or obese make permanent lifestyle changes by teaching them practical and psychological (Cognitive Behavioral Therapy) skills needed to lose weight & prevent future weight gain. 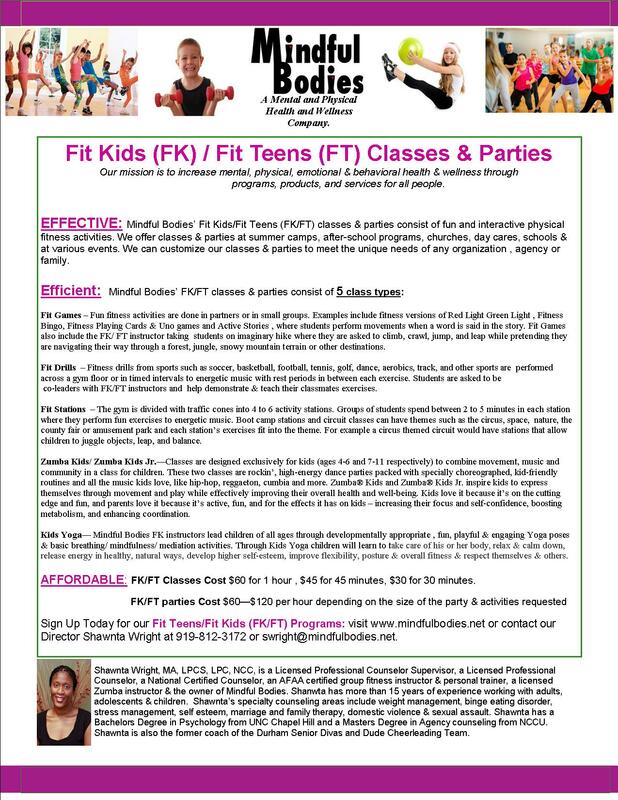 After completion of the FM/FB program, clients may continue to work on weight management through the Forever Fit program (F2) which meets monthly. The cost of group FM/FB sessions is $20 per session. The cost of individual FM/FB sessions is $100 per session. The cost of F2 group sessions is free. FM/FB individual or group session attendance includes once per week Small Group Personal Training (SGPT) session. SGPT is a different Mindful Bodies service than FM/FB so the SGPT sessions are held at a different time than FM/FB sessions. The topics that we will discuss in FM/FB group include (1) Motivate Yourself Daily (wk 1 & 2). (2) Weigh Yourself Regularly & Set Realistic Goals (wk 3). (3) Mindful Eating (wk 4). (4) Give Yourself Credit (wk 5). (5) Get Moving (wk 6). (6) Overcome Hunger, Cravings & Emotional Eating (wk 7). (7) Plan & Monitor Your Eating (wk 8). (8) Follow Your Plan, No Matter What (wk 9). (9)Get Back on Track Right Away (wk 10). (10) Monitor Your Calorie Consumption (wk 11 & 12). 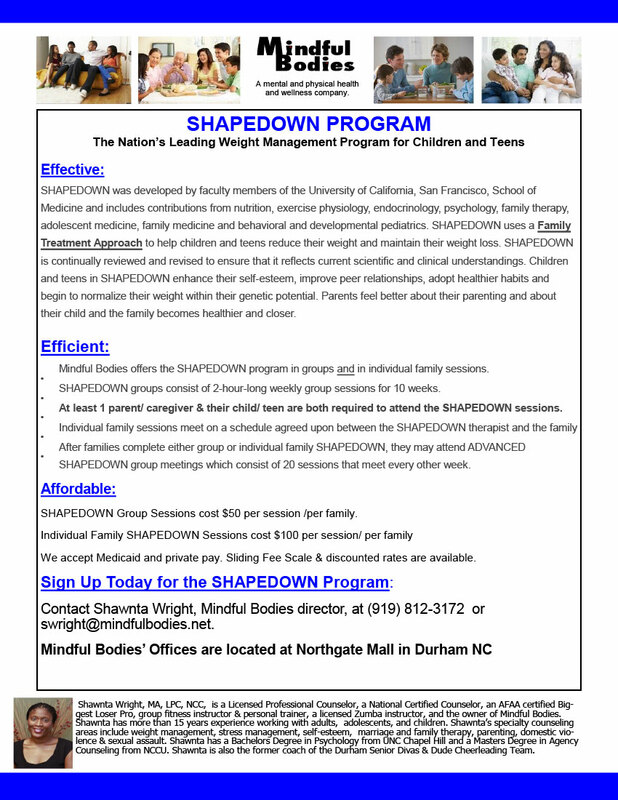 We offer the 10 week SHAPEDOWN (SD) Program for children/teens and their parents/caregivers. SD helps families learn and practice weight management. After completion of the SD program, families may continue to work on weight management through our advanced SD program. The cost of group SD is $50 per family, per session. The cost of individual family SD sessions is $100. We offer clinical supervision for LPCAs and Masters of Counseling students. The cost for LPCA supervision is $35 for 2hr group sessions and $50 for 1 hr individual sessions (1 or 2 LPCAs). The cost for graduate student supervision is free. Mindful Bodies accepts private pay & sliding fee scale (pay what you can afford) for our mental health services.